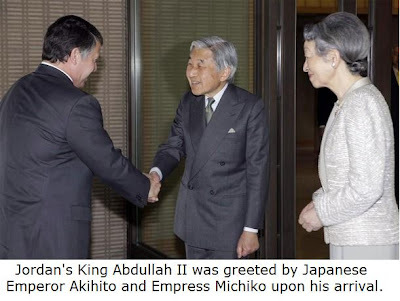 His Majesty King Abdullah II of Jordan was on a three-day working visit in Japan, where he met with His Imperial Majesty Emperor Akihito and a number of high-ranking officials. King Abdullah held talks with Japanese Prime Minister Taro Aso on the means to bolster bilateral ties, mainly in the economic and trade fields, explore areas of cooperation and build strong partnership between Jordan and Japan in the economic and social domains. Discussions also focused on developments in the Middle East and efforts to bring about peace in the region, in addition to regional issues of mutual concern. His Majesty was accompanied by HRH Prince Faisal bin Al Hussein, HRH Princess Raiyah Bint Al Hussein and the King's Personal Envoy Prince Ghazi bin Mohammad. 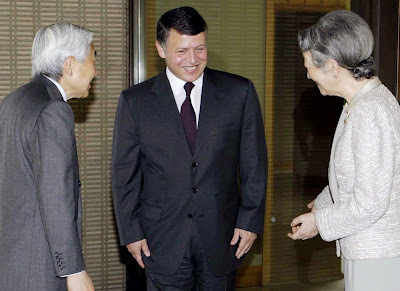 Princess Raiyah is a half-sister of King Abdullah II and is studying at Ritsumeikan University in Japan.